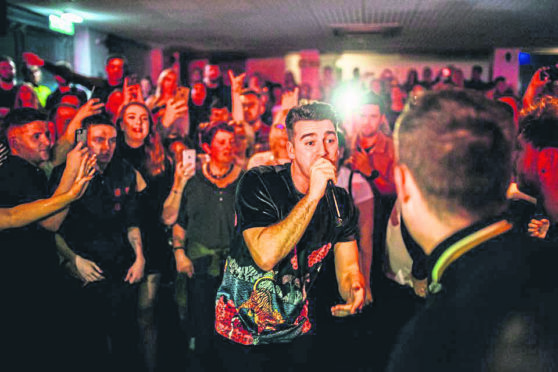 The LaFontaines gave an explosive, ‘beer-soaked’ performance at the Lemon Tree on Saturday night. And sweating under the bright lights of the stage, that’s exactly what Kerr Okan, lead singer with Motherwell four piece The LaFontaines was forced to do. Their third jaunt to the city in the last few years, the band’s unusual Scottish rap-rock – which sounds like in theory that it shouldn’t work – is infectiously catchy. And that was made obvious when Okan asked the crowd who had seen them before, with the majority of those in attendance giving a resounding “yes” in response. Back on tour for their newly released single, Up the Fonts, as the cool kids call them, were on top form once again at the Lemon Tree gig on Saturday night. Very much the showman, Okan was the star of the show, crowdsurfing and jumping into the audience to encourage everyone to sing along. The band, who modestly kept themselves on stage, were as tight as you would expect from musicians that have been tipped for bigger things by many a radio DJ. Fresh from supporting Don Bronco on tour they were full of life and ready to entertain. Soaring singalong choruses, catchy riffs, and street smart rhymes all made this once again a sweaty, beer soaked gig to remember. Audience members ranged from teenagers to those in their 50s and 60s, all bouncing along to anthem after anthem. Forgoing the usual fake modesty of an encore, Okan declared the final song in advance, bringing the gig to sudden sense shattering end. Ears ringing, brows sweating but with smiles plastered all the crowd’s face it was clear that the crowd had been entertained. Like the title of their debut album, The Fonts were ‘Class’.